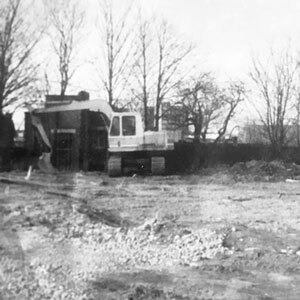 A Liebherr 912, our first excavator working at Rydon site, 1987. 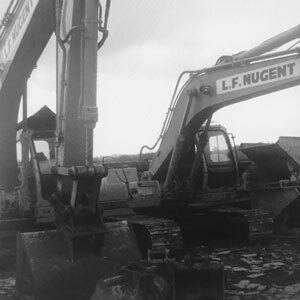 Excavator working at Sheerness docks, 1991. 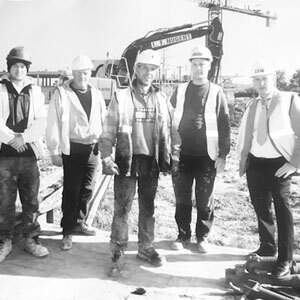 Working at Thomas Bennett School, Crawley, 2000. Lenmark Construction was born from a fusion of over thirty five years of working together by Len Nugent and Mark Schneidau, hence Lenmark. 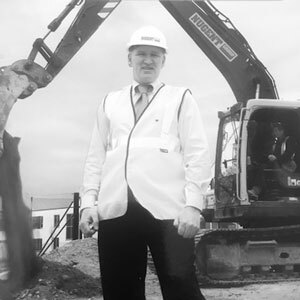 Len has managed many successful construction and development companies including The Nugent Group with Mark working closely by his side for over 30 years. In 2011, the realisation of a dream came true as the partnership was officially recognised by the formation of a new company Lenmark Construction now incorporating the staff and services of The Nugent Group. In 2016, after many years' service within the business both Barrie Rossiter and Sinead Nugent became directors of Lenmark. They are both seen as the driving force that will take the business onto the next generation, with their drive, energy and ambition, they will ensure that the focus is on our customers for years to come. As an enterprise we have now been operating for over thirty-five years, going from just one man and his wheelbarrow, to the multi-million pound company that we are today. We originally established ourselves in 1983, developed and expanded over the years with one clear aim; to be the best we could be in our industry; with an end product that clients and employees alike could be proud of. We also wanted to ensure that our Customers would return to us again and again, bringing more business back to us and enabling us to grow the business. 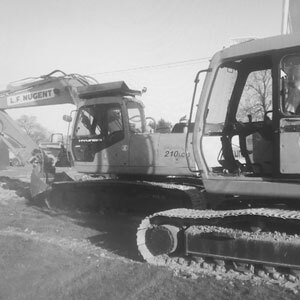 Over the years the Company has seen a great many changes, from father to son, each generation passing on its skills and knowledge, many remembering the days of digging trenches by hand. Now we have a vast range of machinery in place, which enables us to move forward and achieve the same goals, but without the work wounds. We have not, however, merely managed to bring the company forward, we have played our part in being responsible for the industry, as a whole, moving forward. For the last three years we have maintained a safety record of 'Nil Reportable Accidents' and have been awarded many British Safety Councils 'National Safety Awards'. We have set up the country's first Groundwork specific NVQ and, to date, are well on our way to making our mark in the industry as a whole. The various training schemes we have established, for all our staff, have promoted our growth and improved both morale and performance and ultimately our overall reputation. We have worked with our staff developing their ideas, some of which have gone on to be a working success for our business, and now we would like to take this opportunity to thank all our staff for their hard work and loyalty to the company over the years. At the end of the day it is the people that make a business and, as such, we are a working success and a fine example of the fact that we can all live and be what we aspire to be.